F.B. 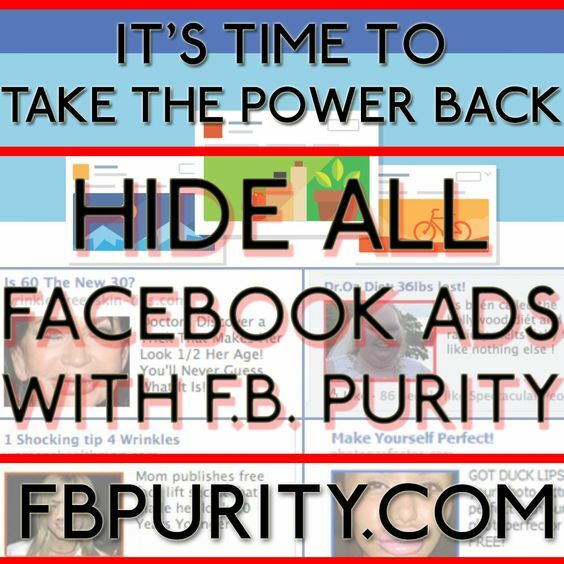 Purity v15.1.0 has been released to give the Facebook user back the power to control what they see in their Newsfeed. Facebook announced that they are going to be attempting to outfox any and all adblocking software, including F.B. Purity. Many users may have already experienced the first wave of this onslaught as it would have broken the previous release of F.B. Purity’s ability to hide ads in the newsfeed and also to filter out posts you don’t want to see in the feed. This release fixes all those issues and shows that Facebook will not succeed, and that they should just give their users, the people who generate the billion dollars worth of content, the choice to view Facebook how they like on their own computers. Fixed: Hidden image thumbnails while uploading images to an album if you have a background colour set. Fixed: The completely transparent posts when a background image was set and “Transparent newsfeed” option was turned on. Fixed: Facebook are testing a new design for the Status Update box, where when you click in the box to start typing your status, the rest of the page goes dark. This version now fixes that, by changing the status box to how it was before. Facebook’s legal team have made Google remove the Chrome extension from the Chrome Webstore due to claimed Trademark Infringement. I am **still** in the process of getting this resolved. Facebook are dragging their feet, I’ve been waiting for them to get back to me on this issue for quite a while now. Until that is sorted, the install/update process for the Chrome extension has changed. Full instructions for doing this are shown on the Install Page in red text below the green “Install F.B. Purity” button. There is now also an alternative install method for Chrome that some users may find easier, listed below the main set of instructions, which explain how you can alternatively install the GM Script version of FBP in Chrome via the Tampermonkey extension. ***WARNING**** There are currently 2 illegal copies of the F.B. Purity extension in the Google Chrome Webstore, they add tracking code to watch everything you do on the web, and may inject ads to sites you visit, or worse. This entry was posted in Facebook, FB Purity and tagged block all facebook ads, block facebook ads, block facebook games, block sponsored posts, block suggested posts, Bubble Chat, chrome add-on, chrome extension, clean up facebook, Customize Facebook, edge extension, edge extensions, Facebook, facebook adblocker, facebook purity, FB, FB Purity, firefox add-on, firefox extension, fluff busting purity, gm script, hide all facebook ads, hide facebook ads, hide sponsored posts, hide suggested posts, maxthon add-on, maxthon extension, Revert Bubble Chat, safari gm script, safari script, tampermonkey script. Bookmark the permalink. I use F.B. Purity v15.1.0 for some time and its a wonderfull extension, the problem is that i still see ads and suggested pages even with the sponsored boxes/stories turned on and auto tag suggestion turned on. Do i need to turn on more options? have you tried setting the language in facebook’s settings to English? many of fbp’s settings work best whent the language is set to english. also are you sure you have 15.1.0 installed? you might want to re-install it, as i have updated some code to fix some minor issues. I was still getting sponsored stories after upgrading to 15.1.0 today. I went into settings and unchecked sponsored stories, saved, then went back in and checked to turn off sponsored stories. They’re gone now. 15.1.0 worked for a while, but it appears that Facebook has pushed out another update, as I’m now seeing Suggested posts, Liked pages by friends, etc. I’m using the Greasemonkey version of FB Purity on Firefox, Facebook is set to English, and I uninstalled and reinstalled the Greasemonkey script, cleared Firefox’s cache, restarted Firefox, and reloaded the page.